Elemental Mercury Poisoning is the accidental or intentional intake of compounds containing the mercury in its elemental form. What is Elemental Mercury Poisoning? Elemental Mercury Poisoning may be also referred to as Elemental Mercury Toxicity. What are the Causes of Elemental Mercury Poisoning? What are the Signs and Symptoms of Elemental Mercury Poisoning? The signs and symptoms of Elemental Mercury Poisoning can vary from one individual to another. It may be mild in some and severe in others. Several systems of the body may be affected. The poisoning may occur due to swallowing or inhalation of mercury. Children are severely affected from mercury poisoning than adults, especially if the element is inhaled. In most cases, ingesting or swallowing small quantities of mercury in its elemental (pure or metallic) form may not cause severe symptoms. The ingested mercury may be excreted from the stomach and gastrointestinal tract without being absorbed by the body, since it is a dense and slippery liquid metal. How is First Aid administered for Elemental Mercury Poisoning? Who should administer First Aid for Elemental Mercury Poisoning? 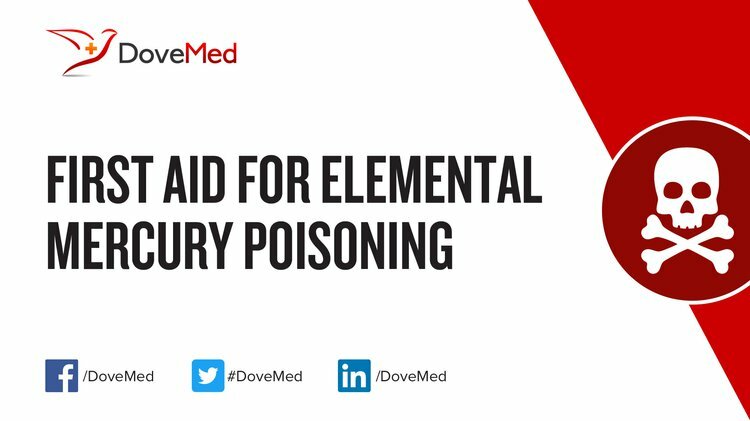 First aid for Elemental Mercury Poisoning is administered by healthcare professionals. What is the Prognosis of Elemental Mercury Poisoning? How can Elemental Mercury Poisoning be Prevented? Park, J. D., & Zheng, W. (2012). Human exposure and health effects of inorganic and elemental mercury. Journal of Preventive Medicine and Public Health, 45(6), 344. Sarikaya, S., Karcioglu, O., Ay, D., Cetin, A., Aktas, C., & Serinken, M. (2010). Acute mercury poisoning: a case report. BMC emergency medicine, 10(1), 7. Brannan, E. H., Su, S., & Alverson, B. K. (2012). Elemental mercury poisoning presenting as hypertension in a young child. Pediatric emergency care, 28(8), 812-814. Rice, K. M., Walker Jr, E. M., Wu, M., Gillette, C., & Blough, E. R. (2014). Environmental mercury and its toxic effects. Journal of preventive medicine and public health, 47(2), 74. Echeverria, D., Woods, J. S., Heyer, N. J., Martin, M. D., Rohlman, D. S., Farin, F. M., & Li, T. (2010). The association between serotonin transporter gene promotor polymorphism (5-HTTLPR) and elemental mercury exposure on mood and behavior in humans. Journal of Toxicology and Environmental Health, Part A, 73(15), 1003-1020. Fernandes Azevedo, B., Barros Furieri, L., Peçanha, F. M., Wiggers, G. A., Frizera Vassallo, P., Ronacher Simões, M., ... & Stefanon, I. (2012). Toxic effects of mercury on the cardiovascular and central nervous systems. BioMed Research International, 2012. Gibb, H., & O’Leary, K. G. (2014). Mercury exposure and health impacts among individuals in the artisanal and small-scale gold mining community: a comprehensive review. Environmental health perspectives, 122(7), 667. Goodrich, J. M., Wang, Y., Gillespie, B., Werner, R., Franzblau, A., & Basu, N. (2013). Methylmercury and elemental mercury differentially associate with blood pressure among dental professionals. International journal of hygiene and environmental health, 216(2), 195-201.